Well, we did it. We moved back to Tuscany from Australia. Something about the way of life and the role that family play here in Italy were enough to call us back to where our hearts belong – although we did leave behind a piece of our heart in Australia too. Being back in Tuscany in spring has been great. I’ve been revelling in that much too short season of ‘perfect’ weather: not too hot, not too cold, not yet too crowded to enjoy strolling through Florence to catch up with friends or walking down to the water’s edge of our new seaside home. And the whole time eating my weight in artichokes, one of my favourite, though fleeting, seasonal vegetables. 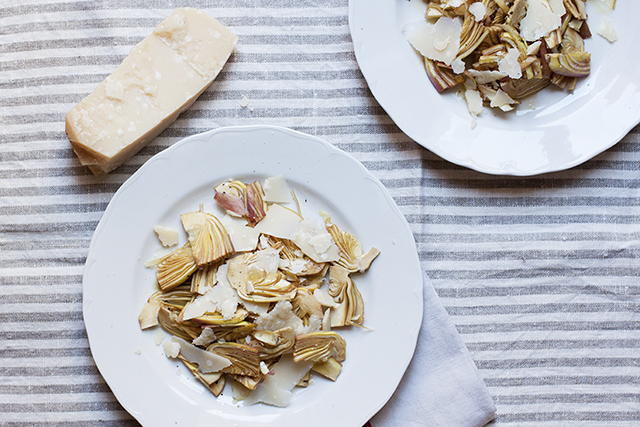 This raw salad is one of the best ways to enjoy good artichokes. You’ll commonly find this insalta di carciofi on Tuscan trattoria menus as an antipasto but it’s also a great one to do at home – despite having to prep artichokes, this is a very simple and very quick salad that goes with everything from fish to meat to being a meal on its own (perhaps with a heavy ball of burrata and crusty bread). First choose good artichokes. Young ones, if possible. I realise here in Italy we get spoiled with the most wonderful artichokes. They are native to Italy so the variety of artichokes you find here, from region to region, is simply staggering when compared to what you can find outside the boot. Also, the volume — every market and every shop or roadside stall is brimming with piles of artichokes at this time of year. Not old, tough artichokes with hairy, thistle-like hearts, but young, tender artichokes that are firm, not springy, when you give them a little squeeze. Here in Tuscany, you find most commonly the dark purple kind with a pointed head and sometimes tiny thorns on each leaf. 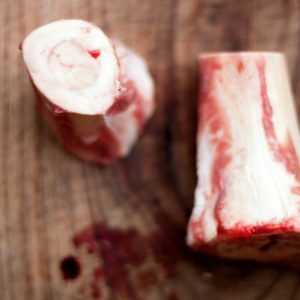 They usually come with long stalks (the best bit, some say – just peel them of their tough outer skin and cook the rest) still attached. You peel the leaves off one by one until you reach the most tender and pale-yellow coloured leaves. 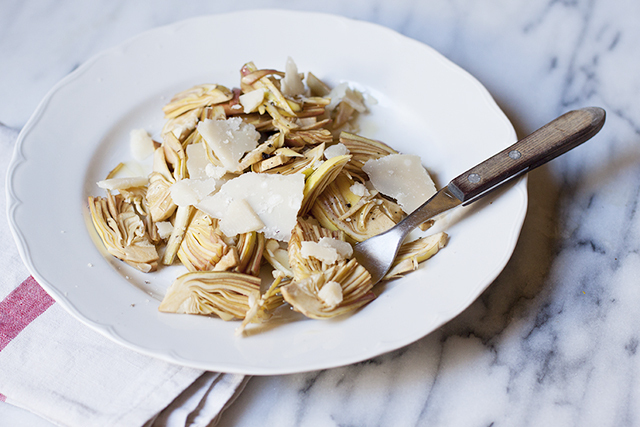 The stem and bottom are trimmed a little and then the artichoke is ready for eating – whether braised like in this Roman stew, vignarola, or eaten whole with a little stuffing (like they do in Tuscany or in Sicily). It has to be said that the best artichokes you can use for these are young ones. Since you’re eating these raw and artichokes can have a rather astringent quality to them, you want lovely young and tender artichokes rather than older and tough ones that do better when cooked. A good sprinkling of your best salt and some shavings of proper Parmesan cheese are an excellent foil to counter that astringency. Finally, some tart lemon juice and a rather peppery olive oil round things off nicely. The only thing that is difficult to pair with this is wine. White wine will amplify the ‘greenness’ of the raw artichokes. 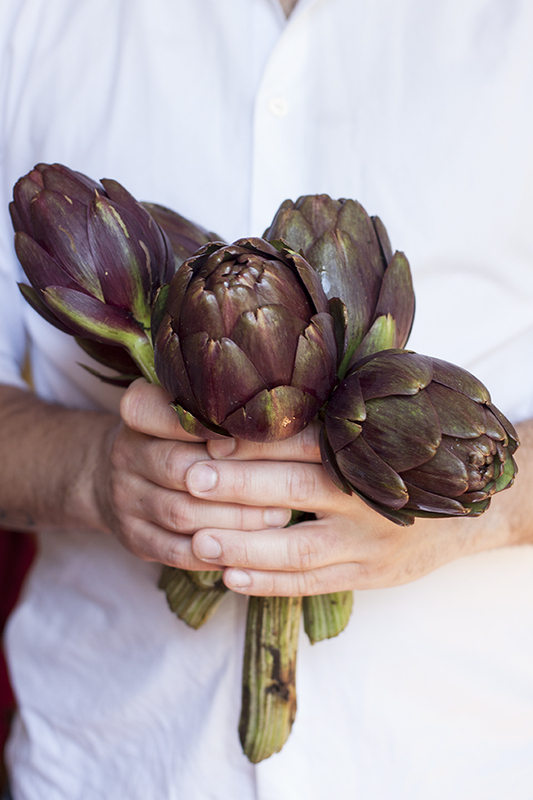 Red will bring out the tannin-like astringency of the artichokes. Best to leave wine out for this course and go with a cool glass of water, which you will notice will taste so very sweet after you’ve taken a bite of this salad. Have ready a large bowl of cold water with half a lemon squeezed into it. Keep the other lemon half handy for rubbing any cut parts of the artichoke as you go. Artichokes oxidise when exposed to the air and you will want to make sure they don’t go black for this pretty, raw and simple salad. Fill a large bowl with cold water and squeeze the juice of half a lemon into it. Prepare the artichokes by peeling the tough outer leaves off one by one, from the bottom going around and up until you reach very pale-coloured, tender leaves. Cut the stalk to about 3cm long and then trim the bottom and stalk. Rub the cut parts with the lemon half as you go. Cut the top pointed half of the artichoke off completely then place the artichokes in the lemon water until you have trimmed all the artichokes. One by one, slice the artichoke in half vertically. 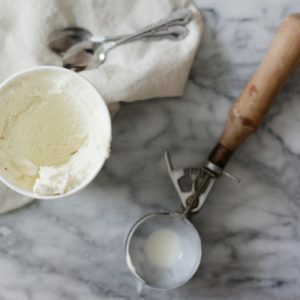 If there is a fluffy/thistle-like choke, remove it with a teaspoon (or a grapefruit spoon). Thinly slice the artichoke half and immediately place the artichoke slices in the lemon water. Continue with the rest of the artichokes. Drain the artichoke slices well. Place in a large bowl and dress with the rest of the lemon juice from the lemon half, a few tablespoons of olive oil, a good pinch of sea salt and a grinding of black pepper. 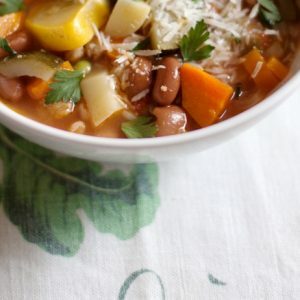 Scatter with Parmesan shavings and serve. I love a raw artichoke salad and was lucky to find some tiny artichokes at the farmers’ market yesterday. I look forward to hearing about your life back in Florence. Great, they should work a treat! I’ve never posted on a blog, followed yours for ages, yet must say I am so happy to hear you have moved back to tuscany. Good luck to you and the family – please keep the Italian traditional stories going, where ever you may be. Thanks for your comment, David, definitely made my day! 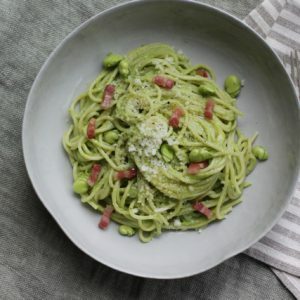 Ciao Emiko, I adore this insalata, i did it this winter many times, sometimes like contorno other like secondo piatto with prosciutto affettato ! Fantastic. Benvenuta dinuovo in Toscana.